The Rental Assistance Demonstration (RAD) is a voluntary program run by the U.S. Department of Housing and Urban Development (HUD). Under RAD, HUD changes how it provides rental assistance to a method that we expect will be more stable in the long-term and makes it possible for MPHA to access money to repair and improve the property now or in the future. RAD was created to help housing authorities like MPHA preserve and improve our public housing. Housing authorities around the country have already used RAD to preserve almost 100,000 units of public housing. Until recently, the program has been capped. However, Congress recently allowed HUD to raise the cap, allowing MPHA and others to apply for the program as a means of preserving the homes we provide. Under RAD, public housing residents cannot lose their housing and have a guaranteed right-to-return. The RAD program forbids permanent, involuntary displacement. No family can lose their housing because of RAD. Where there are major building improvements, this work will proceed just like any other rehabilitation work MPHA performs on our properties, and residents may need to move temporarily while we work on your apartment. If MPHA’s RAD application is accepted by HUD, work is not likely to begin for many months, or even a year or more. If you do need to move temporarily, you are entitled to certain relocation protections under the RAD rules, including advance written notice and detailed information about the move. You will also be entitled to advisory services, moving assistance fully paid by MPHA, and other payments. Under RAD, residents have a guaranteed right-to-return to the property, with no new eligibility screening. A RAD conversion, and any relocation associated with it, must be implemented consistent with fair housing and civil rights requirements, and we will provide contact information to process reasonable accommodation requests for residents with disabilities. Resident rights under RAD are guaranteed in Attachment 1.B of the HUD notice governing the RAD program. Rent under RAD is calculated the same as before: 30 percent of income. Rents in a building that has undergone a RAD conversion continue to be set at 30 percent of income, just as in traditional public housing. The only people who might see a modest increase in rent are those few households with the highest incomes, who pay “flat” rent (also sometimes called “ceiling” rent). While these increases would be modest, and only affect a small number of people (five out of 174 households at the Elliot Twins, for example) MPHA has committed to holding these families harmless (i.e. no rent increases at all) in the initial years after RAD. What partners might MPHA work with? Where we use RAD, MPHA will be the property developer and MPHA will continue to manage the properties. We will work with partners in the community to secure the funding to undertake the work. Funding may include loans, bonds, grants, city and/or county funding, Low-Income Housing Tax Credit (LIHTC) investments, and potential energy savings arising from the renovation. We will also work with architect and construction partners. MPHA will never hand over sole ownership or control of our properties to a private developer or anyone else. RAD does not change essential resident rights, including a grievance process and a resident council. When the property converts, you will sign a new lease. This lease keeps the existing resident rights under your current lease, including the ability to request a grievance hearing and the timelines for termination notification. You also have the same right to organize, and resident organizations will continue to receive up to $25 per occupied unit, per year. What specifically happens to the funding under a RAD conversion? RAD allows housing authorities, with HUD approval, to convert properties from one federal funding platform (traditional public housing) to another: project-based rental subsidies under Section 8. There are two different options under the program; MPHA would use the option to convert to a “Project-Based Section 8” subsidy. One reason this is considered more stable is that MPHA will receive one funding stream, rather than the two separate funding streams for public housing operating subsidy (which has proven highly volatile in recent years) and public housing capital (which has been in years of steep decline). Although the funding stream changes, it is important to note that the project-based funding after RAD is no less “public” than before. It is simply a different form of public housing funding. MPHA already provides project-based housing across Minneapolis, where we pay the rent subsidy to an owner and manager of affordable housing, who rents those units to a low-income family. In the case of RAD, however, we will be essentially project-basing the units with ourselves (specifically, with a nonprofit fully controlled by the housing authority). Why go through all of these twists and turns? It is admittedly a complex process! But it opens the door to a simple goal: the same families, in the same housing, with more funding to preserve the homes for the long-term. No. There is simply no way in which RAD privatizes public housing. RAD allows a housing authority to obtain investment from new sources, by borrowing money or working with low-income housing tax credit investors. However, MPHA will always remain a co-owner, including full ownership of the land on which the housing sits; federal public housing subsidies continue flowing to every unit, keeping rent affordable and resident rights protected; RAD itself is a federal program, with fundamental, built-in rights that protect residents; underlying legal documents prevent the properties from being sold or used for anything other than housing for extremely low-income families. A RAD conversion by MPHA does not allow public housing buildings to be sold and residents displaced. There is a recent government report on RAD. What did it have to say? There is a General Accounting Office report from February 2018 titled “Rental Assistance Demonstration: HUD Needs to Take Action to Improve Metrics and Ongoing Oversight.” We encourage anyone to read the report for themselves at https://is.gd/GAORADReport. It is most important to note that—as the title suggests—the report’s findings and recommendations are entirely directed at HUD, and how HUD tracks data related to RAD. Specifically, the report recommends improved “procedures in place to evaluate and monitor the impact of conversion of public housing properties” under RAD. Notably, the report is not critical of housing authorities that have used RAD, of the outcomes for residents under RAD, or of the RAD concept. It includes valuable feedback from residents and public housing authorities on how to improve the RAD process. HUD agreed with all of the recommendations and has moved forward in multiple ways to better track how the program is meeting the goals of the RAD program, which are stated unambiguously at multiple points in the report: “the long-term preservation of affordable units and protection of residents.” MPHA supports any studies or feedback, including the GAO report, that help the RAD program better achieve these objectives. To-date, housing authorities have used RAD to preserve more than 91,000 units of public housing. Find descriptions of RAD conversions in other cities by visiting https://www.hud.gov/RAD/news/case-studies. Learn even more from the links on the right! HUD has approved MPHA’s application to use RAD at one property, the Elliot Twins. 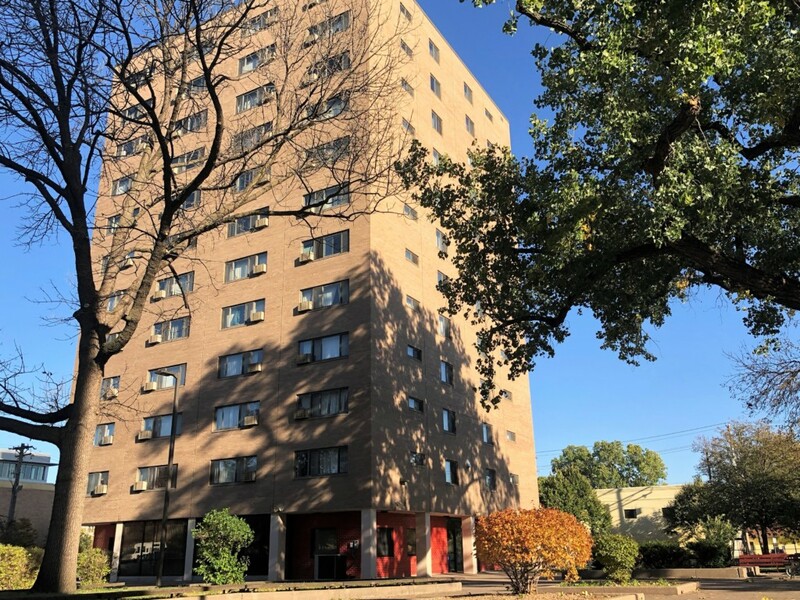 The Elliot Twins are some of MPHA’s oldest highrises, built in 1961. HUD Notice 2017-03 (Revision 3) – The primary HUD notice that governs the RAD program. HUD’s RAD Home Page – for those who want to learn even more! Residents: If you need language assistance or reasonable accommodation for a RAD meeting, or your RAD notice in an alternative format, call our RAD Assistance Hotline: 612-342-1200. Deganayaasha: Haddii aad dooneyso in lagaa caawiyo xagga luqadda ama baahi kale oo aad qabto oo la xiriirto naafanimo kuu gaar ah, la soo xiriir khadka Telefoonka gargaarka ee MPHA ee 612-342-1200.